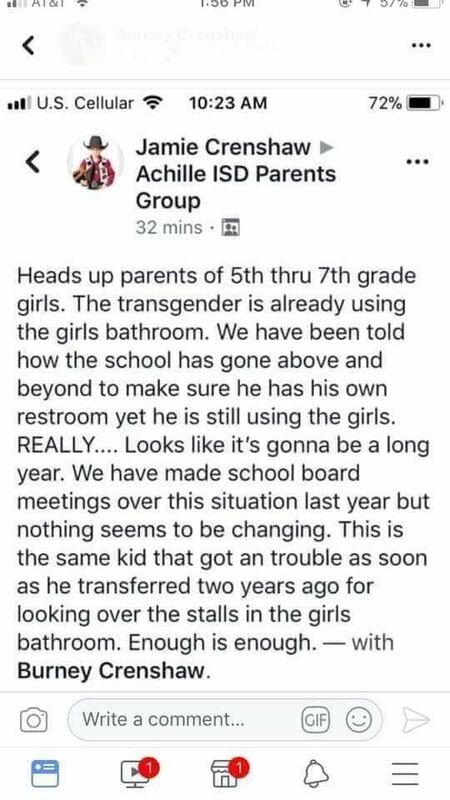 The Achille ISD school district in Oklahoma completely shut down from Monday, August 13, to Wednesday, August 15, as a result of threats made against a transgender child by parents of the child's fellow students. 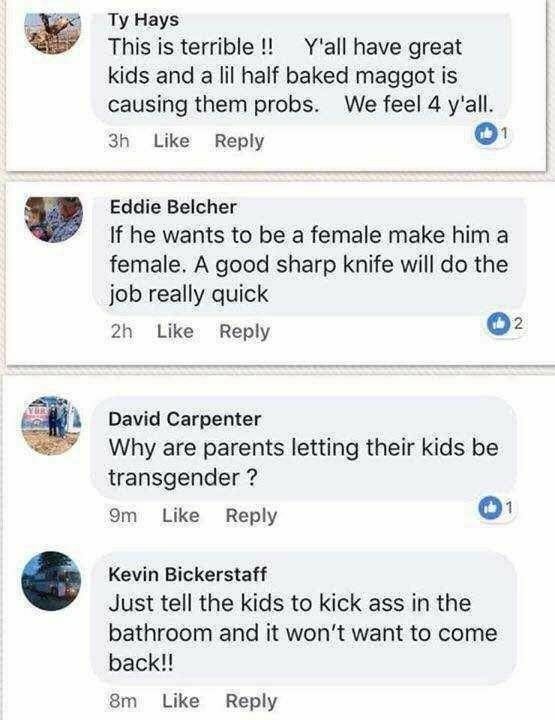 In a private Facebook group for parents of children in the school district, parents began posting transphobic comments about the little girl, which "included plans to attack the child with a knife and have her beaten up by other kids at the school." What prompted these horrific threats? 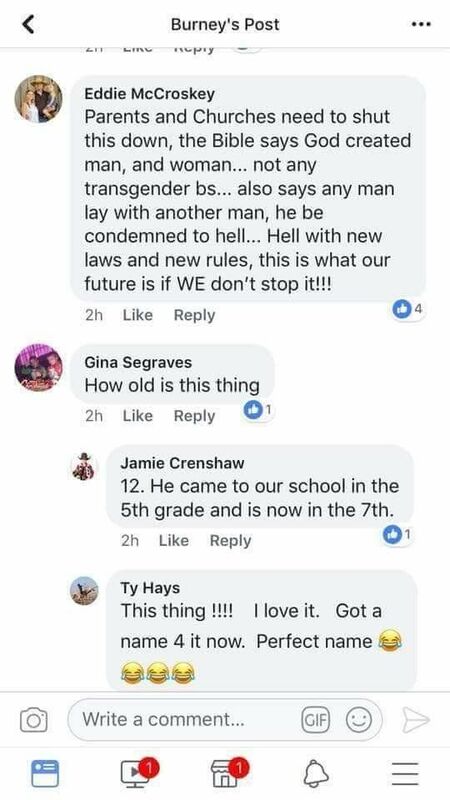 Maddie, the trans child, used a girls bathroom on the first day of school. If he wants to be a female make him a female. A good sharp knife will do the job real quick. We are putting in extra measures to help safeguard our students. We appreciate all the concern for our Achille students. Our school is shut down until Wednesday for safety precautions. While I will not go into specifics, we have increased security. Local news station KXII reports that Maddie and her parents are afraid for their safety, and are "staying at a secure location." Achille Public Schools and administration believe everyone should receive a safe and free education. We have a very talented staff that cares about each and every student. We remain one of the few small Oklahoma schools to have a resource officer and have had [one] for the last several years. I know there are a lot of kids struggling. Our homeless youth population here — a good chunk is LGBTQ+ kids who have been kicked out by their families. When my child came out to me, my first thought was, 'Oh my god, world, please don't hurt my kid.' My first fear was for their safety; how they're going to be treated out in the world. Paula Sophia Schonauer, a retired police officer who ran for local office in 2014 (and lost by only 22 votes), commented that incidents of hate have increased in frequency since President Donald Trump's election in 2016. Right after the election, I was filling my tank at a gas station, and someone drove by and called me a freak. And people generally have reported to me more blatant discrimination since then. Schonauer believes most of Oklahoma's residents are "fair-minded" people, but that many "just don't know enough about trans issues yet." 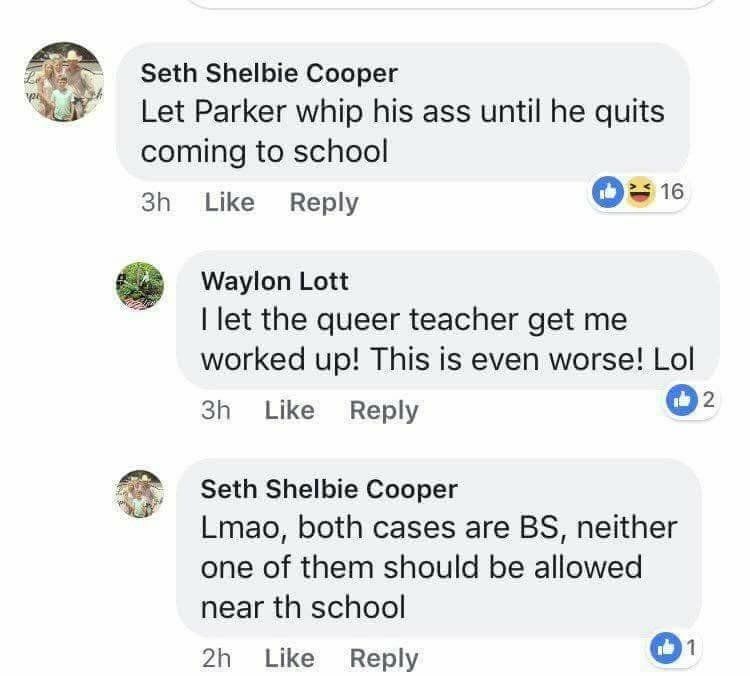 If given the chance to interact and learn about real trans individuals, she's confident transphobic incidents like these will become less common. We can only hope that this is true, and that Oklahomans are given an educational opportunity soon.